We are coming to the end of half term now and it's been a great week for reading and writing! With hubby away and the sun resolutely refusing to shine,even the garden wasn't tempting me away from my books. So two complete, and a third one on the go already, it's really been quite blissful! I haven't been inside all the time though. We had a lovely trip to Hughenden Manor and a very enjoyable ladies-who-lunch sojourn in Marlow with my niece. A comfy chair may however, not be the best place to read Why Be Happy When You Could Be Normal? This is an honest autobiography by Jeanette Winterson, probably still best known for her earliest work, Oranges Are Not The Only Fruit. I also read Lighthousekeeping in 2014, and a mini review of that can be seen in blog post number 7! It comes as quite a shock that the title of the book is a direct quote from Jeanette's mother. Adopted as a baby, Jeanette's life with Mr and Mrs Winterson was not traditional. It was not comfortable. Indeed, it was not even remotely kind. The book opens with another one of her Mother gobbets, uttered to the child Jeanette in times of anger, "The Devil led us to the wrong crib." I cannot imagine what such rejection must have felt like, but Winterson makes a very good fist of conveying her emotional response.She is a talented communicator and writes with a dark humour that goes some way to making the story of her childhood more bearable. Feisty from the outset, Jeanette learnt deceit out of necessity. Banned from reading or owning books other than the bible, she became a prolific reader by stealth. Her interest in language was ironically nurtured by her mother who read from the bible every day, "it was intimate and impressive all at the same time." And it is here that the book's compulsion is evident. There is a tension throughout the retelling of her childhood, a tension that exists between love and hate, between acceptance and rejection, between profit and loss. And it is the loss that resounds. Her mother is lost. She clings to a strict and loveless version of faith that emphasises judgement and loses compassion along the way. She abhors her own body and cannot be intimate even with her own husband, prefering to stay up all night rather than share his bed. It is clear that Mrs Winterson, always referred to with this moniker of detachment ,was broken. It is equally clear that "Dad", though more affectionately referenced, was weak, and did little or nothing to reach out to his daughter. Jeanette was born in 1960, and was brought up in industrial Accrington. The scenes depicted could be as easily 1940 as 1960; modernity hadn't reached the two up, two down factory housing. Toilets were outside, milk was delivered, supermarkets were a vision for the future and central heating a luxury nobody could afford. Jeanette had learnt to lay and light a fire by the age of 5; a necessity as her Mother would be in bed, getting in once her father had got out and up for his early shift at the power station shovelling coal. Jeanette was often on the doorstep herself, locked out by her mother for some misdemeanour. All night. That or the coal hole. Language rescued Jeanette, lifted her from the mundane, the cruel, the extraordinary which was her ordinary. Bible reading from the 1611 King James version meant that complexity never daunted her. Indeed, she makes a very good point about modern attitudes to language and learning. In the north in the 1960's many men went to evening classes at Working men's Institutes. Shakespeare was often on the curriculum. The language was the same as the bible that was the bedrock for many working class families, "It was a useful continuity, destroyed by well-meaning, well-educated types who didn't think of the consequences for the wider culture to have modern bibles with the language stripped out." And so in her coal hole or on the doorstep, Jeanette made up stories, narratives that took her outside of the cold and transported her to a bigger world. Hyprocritically, Mrs Winterson sent Jeanette to the library to get her weekly dose of crime novels. Apparently these bypassed the "trouble with books is that you never know what's in them until it's too late." Jeanette was not allowed to read fiction, but she became adept at lingering at the library and soon began to use wages from her market job to buy paperback books. She hid them under a mattress and ultimately worked her way through English Literature A-Z in Accrington Public Library. And she hid much of what was important, because to communicate affection or its lack was impossible. She had to find all her resources internally, committing prose and poetry to memory, escaping in her head before she was able to escape for good. And escape came too early. It was forced on her by a mother who would not tolerate a daughter who found pleasure with other girls. She was forced out of her home, with no money, no resources, no alternative, at the age of 16. Rescue came first in the form of a friend's mini and then from a teacher who offered her food and lodging. And so the book goes on, a gripping tale made more so because it is real. Mrs Winterson was awful, but it was because of her that Jeanette Winterson is who she is. Amidst the anger, there is guilt. Amidst both there is a tangible thread of love. It is not affectionate, but it is fierce. "I do know, really know, that Mrs W gave me what she could- it was a dark gift, but not a useless one. "The second half of the book explores adulthood, relationships, breakdown and recovery. It also tells more of the adoptive story and a search for the truth. The childhood section was compelling in its paucity of love and affection. The search in adulthood had me burning the midnight oil to see how things have turned out for Jeanette. And anyone who knows me will realise that anything past 11pm (or maybe earlier if we're honest) struggles to hold my eyelids open! My overwhelming response is a need to applaud. 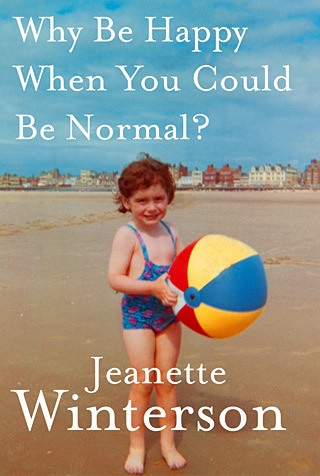 Jeanette Winterson is strong, resourceful, independent and capable of learning. Her lifetime has been learning that loss and love are equally strong forces. Her adulthood has been a trial of learning. To love and be loved. We all have a story. Hers is worth reading and admiring. And it is unfinished. The final lines of the autobiography read with searing honesty, "I have no idea what happens next."